Want to Understand your Shipping Rates? Pricing for shipments sometimes seem to be the great cloud of unknowing. Why is it difficult to get comprehensive shipping rates instantly? Why do prices fluctuate so much when shipping to one city vs another? Well, we’re glad you asked. In this guide we will walk you through understanding shipping rates and what variables influence pricing. Before we get into all the details of shipping rates, let’s take a quick look at a key component of how all shipments are moved, which is a shipping network. A shipping network is comprised of people, assets (trucks, planes, rail, containers), warehouses and anything else that is needed to complete a pickup and delivery. Freight is picked up and routed through a network to deliver your shipment from end to end. All carriers have networks and are even part of other carriers’ networks. Yes, even the big guys rely on other companies to make pickups and deliveries. Just like trying to download a massive file at the same time as your coworker, all networks have constraints. Shipping is no different. With constraints such as how long it takes to get from point A to point B, capacity limits, available truck drivers, warehouse locations, weather, and so on, the stress your shipment puts on a network is the main driver in what price you will pay for a shipment. We’ll look at three major factors that influence your price: shipping details, availability, and market fluctuations. The first determining factor on pricing is how fast you need a shipment to be delivered compared to how far it needs to go. 1 day service to a neighboring city is easier to complete than 1 day service across a country. Time will have the most impact on your price, as it is the ultimate constraint. Letting a carrier dictate when your shipment will be delivered is usually the cheapest way to ship. When a shipment is not time-sensitive it will move through the carrier’s network on the route that works best for the carrier’s capacity. When a shipment needs expedited service, often it must move on specialized routes, possibly on a plane or a dedicated vehicle. Due to the added resources needed to make the scheduled delivery, the price will go up. The next important factor in determining shipping rate is the size of your shipment. Remember, your shipment needs to fit inside a vehicle. Just like the time you tried to fit that couch into the backseat of your car, sometimes it just doesn’t work. A 53’ truck trailer, which often is used in shipping, is on average 8’6” wide, and 8’9’’ high, so if you have a shipment that exceeds these dimension, it will require specialty equipment, which will influence cost. Similar to carry-on luggage with the airlines, all carriers will have specific size restrictions and anything above that size will cost more to be moved or may even be rejected. Air shipments have specific dimensional constraints as well, and anything over sized will have added fees and charges. Another thing to note about size, is its relationship to weight. In the past, the total weight was a main factor in shipping, and still is up to a certain weight, but carriers will also base charges on the dimensional weight of a shipment, also called density. Dimensional weight looks at how much space your shipment will take up inside a truck or plane by measuring to the longest, tallest and widest points. So, when you have an irregular shaped item, imagine drawing a box around your shipment, as that space determines your dimensional weight. 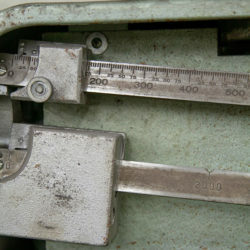 If your dimensional weight is greater than your actual weight, your dimensional weight will be used for shipping rates. You would think the farther a shipment must go, the more expensive it will be to ship, right? Well, not necessarily. In shipping, carriers’ rates are based on whether they can use common shipping lanes or not. Just like a well-worn path is easier to hike than forging through a dense forest, highly traveled routes between distribution centers and standard market areas are cheaper to move goods through than less traveled or remote areas since more trucks are available. So, shipping something from Cleveland, Oh to Casper, WY can be similar or more expensive than shipping from Cleveland to Los Angeles, even though L.A. is a much farther distance. As you would expect, it takes more fuel to move something on a truck that is heavy than it does to move something light. Trucks on the road also have weight capacity limits regulated by the DOT. If your shipment eats up a large part of that weight, fewer shipments can be added to the truck before it reaches the allowed weight, thus your price increases. If you have to move something over the allowed DOT weight, expect to contract a specialty carrier. Providing a description of what is being shipped is used as a classification system for freight, but it can also raise other questions a shipping company may want to know. For example, is the material hazardous? Is it going to a commercial, retail, construction site, or residential address? Will it need a liftgate for delivery? All these questions are asked by good shipping companies as some shipments will need special requirements for a successful delivery. Extra requirements are known as assessorials, and each one needed will increase the shipping rate. A shipment needs two things to be successful, an available truck and a driver willing to deliver to your address. In a perfect world, there would always be trucks and drivers available for every shipment out there, but that just isn’t the case. Let’s look at two different types of shipments and how availability impacts price. When shipping LTL (a shipment requiring less than a full truckload), transportation carriers have availability to fit a lot of shipments on one truck. They can offer lower prices per shipment since you are only charged for the space you take up. However, there are other reasons LTL pricing fluctuates. Since each shipment is going to a different location, the LTL carriers need to unload at a distribution center, then figure out what route to put it on for the next leg of transit. If there is not enough space for your shipment, it will have to wait in line for the next ride. Therefore, LTL shipments usually give you a suggested transit time, for example 2-4 days. If you have flexibility this can work out great, but if you need to jump the line to get something moved more quickly, you’ll have to pay for that. Another important note is that most LTL companies are regional, so if they are offering service nationwide, they are usually in an alliance with other LTL companies in different regions. This gives them more geographical access, but if they pass off your freight your price will probably be more expensive than if they can handle it internally. A full truckload, unlike LTL, contains freight all going to the same location, so it skips the network and provides dedicated service from point A to point B. Full truckload pricing is based solely on supply and demand. Is a truck available in your area to take the load and is anyone willing to drive it where it needs to go? Larger metro areas have more goods coming in and out, so usually there is greater truck availability. When there are a lot of trucks available in an area, and the delivery is another common metro location, the price will be competitive. This is because truck drivers can quickly find a new load after they deliver and be on their way making money. When one or both of your locations are outside common lanes, expect to pay a premium as a driver may have to drive empty (deadhead) to another area to pick up a load after they deliver yours. Understanding this will help you have the right expectations when getting pricing for a full-truckload. (For more information about why FT pricing has been rising in 2018, check out this blog post). There are other factors that affect your price that have nothing to do with your shipment. Produce seasons, natural disasters, union strikes, regional projects, regulations and laws, can all impact a shipping network, reduce availability, and cause prices to rise. For example, trying to get a truck out or Washington during apple season may cost you double what you paid a month before. Or maybe a regional energy project needs materials trucked in every day from your state. As they grab up those trucks and capacity shrinks, your price to get one will rise. Natural disasters can limit access to common lanes or increase the need for building materials to be shipped into a region, utilizing many trucks on the road. You may be thinking this is just for people looking for full truckloads, but LTL carriers consolidate their freight into full trucks to move between distribution centers, so their pricing can be affected as well. With the above knowledge in hand, take a look at your shipping process throughout your entire supply chain to see where you may be able to make improvements. Minor adjustments can lead to big savings over time. Check out the tips below, and as always, let us know if we can help. Understanding the availability element should clear up some answers on why pricing can be unpredictable. If the roller coaster of the spot market makes you dizzy and stressed, there is a way to help control pricing swings. Working with a carrier and developing a rate contract can help solve the availability problem. The contract will promise a certain amount of freight for the carrier to move and a locked in rate for the shipper and the promise of availability. You may pay more than the spot market on certain days, but you will also be protected from overpaying when the market prices rise and have the confidence your products will move according to your schedule. When multiple brokers are searching for trucks to fill your request, the truck drivers can realize different brokers are asking for the same load. This creates a bidding war against yourself! Limit how many brokers you work with to protect yourself from bidding against yourself. When shipping LTL, control your dimensional weight by not adding anything to the top of your shipment, for example a “Do Not Stack” cone, unless your shipment absolutely needs it. Your shipment will be measured from the floor to the top of the cone and you will be charged for the extra space. When talking with a carrier for a shipping quote, convey accurate information especially with your size and weight. When a shipping company picks up your shipment, it will be measured and weighed on an industrial scale at their facility or on their truck, and those details will be used for the shipment. If your quote was based on the wrong weight or size, expect an adjusted rate on your invoice. Always try to give the actual size and weight after it has been prepared to ship to get the most accurate quote. There are companies that have knowledge and experience of shipping networks and have learned the strengths and weaknesses of different carriers. They can create custom solution based on their own network, or help you utilize the best network for your specific shipments. This can help you stay in control of your shipping and spend less on inefficient transport.